In 1999, a collection of beautifully crafted and placed tools were unearthed at Caddy Park in Quincy, MA during construction of a playground. 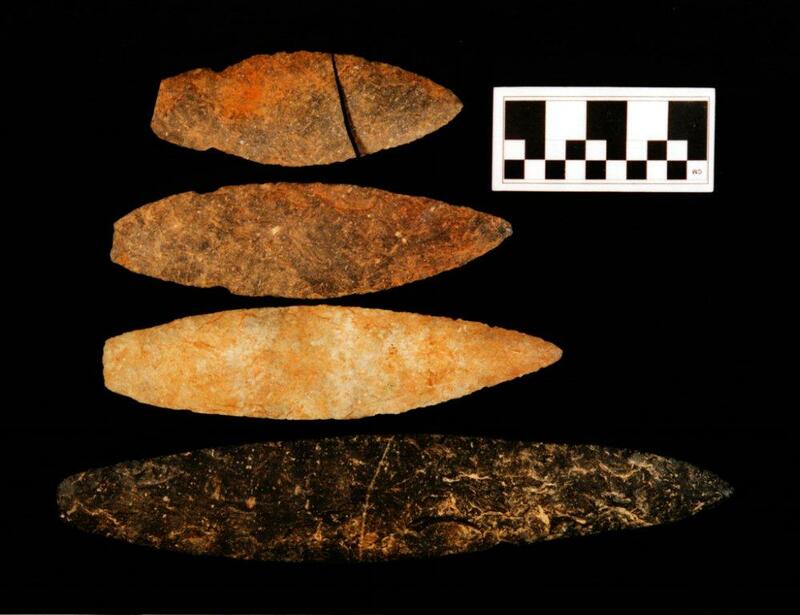 These artifacts, which are thought to be about 3,500 years old, reveal exciting new information about the life of the First People of the place we now call Quincy. Some of the major artifacts found include a whale effigy partially surrounded by four plummets (net sinkers that were probably attached to a net), four adzes (indicate woodworking and boat building), small stem points and an atlatl (indicate hunting), and four large blades (indicate possible ceremonial activity). The artifacts were placed on a layer of red ochre, and a layer of red ochre was sprinkled on top of the artifacts in an area that measured about 3 feet by 6.5 feet. Archeologists think the site may have been a burial, cenotaph, cache, or ceremonial offering. Members of the Massachusett Tribe think the site was a cenotaph created to honor an important person who was lost at sea. Archeological study of the artifacts brought them to Colorado, where they remained for many years. Thanks in part to the persistence of those involved in the Passanageset Project, the 256 artifacts were returned to the Commonwealth at the end of 2016 and the third objective of the project was met.